I remember when I was ten years old and my older sister, unbeknownst at the time, fell to the floor of our home shower after having been misdiagnosed for what we learned was pneumonia. Three weeks prior, she went to the doctor complaining of flu-like symptoms and a high fever. She was treated for an ear infection with a gentle antibiotic. Three weeks later, I was running to grab my grandmother from the kitchen and have her call emergency assistance, 9-1-1. In those three short weeks between misdiagnosis and proper treatment, my sister’s pneumonia escalated and her illness grew to a bacterial and viral infection causing lung damage and chronic asthma. It took her over a month to bounce back. Mercy, the 5th largest Catholic health care system in the US, is dedicating efforts to ensure that situations similar to my sister’s never happen. Mercy recognized the opportunity to improve the quality of care and costs by employing standardization, noting that a large portion of the inefficiency in healthcare can be contributed to failures in care delivery, care coordination, and overtreatment. The organization is focusing on applying evidence-based practice to everyday care of common conditions. Mercy is the proud winner of a 2016 SAP HANA Innovation Award and the HIMSS 2016 Enterprise Davies Award because of its use of innovation to not only save money with advanced technology, but also save lives. These are just a couple of the awards and recognitions that Mercy has received for its innovative approach to patient care. For Mercy, prior to innovating with advanced technology, its mortality rate for pneumonia patients was at or above the national rate, ranging between 4%-5%. Through the use of SAP Solutions, Mercy reduced pneumonia mortality rates to less than half the national average and decreased the time it took for patients with pneumonia to receive antibiotics. As proved by my sister’s case, time wasted in treating pneumonia properly can cause serious complications like lung damage, asthma, viral infection, or worse. In addition to pneumonia, Mercy ran three additional use cases with their new technology. The organization decreased the time it took to administer a diuretic to patients with heart failure by nearly three hours. The clinical process helped Mercy lower mortality rates to less than half the national average for heart failure patients. Mercy also achieved $9.42 million in cost reductions from eliminating the use of certain surgical products based on data that established best practices across all surgical departments within its system. And by improving its clinical documentation ensuring that physicians properly capture clinical diagnosis, the organization has attained $65 million in additional revenue. Today, at HIMSS 2017, Jamie Oswald, MBA, MIM, Manager, Data Analytics & Engineering, Mercy and Kerry Bommarito, PhD, MPH, Performance Analyst, shared insight into a new project that the organization is running. 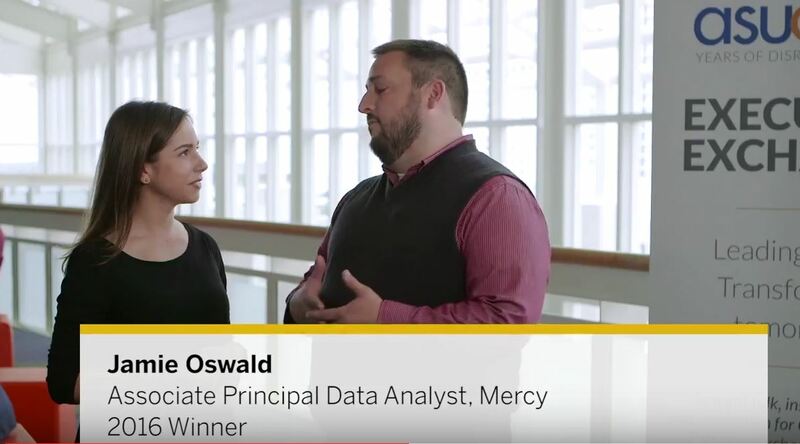 By using historical transaction data, Mercy leveraged the SAP BusinessObjects Analytics portfolio to create time-series models for each medication in its dispensing cabinets. These models forecast future inventory needs so that the organization can predict demand fluctuations, manage resources, and provide top quality care for patients. In some cases, like with antibiotic, Cefazolin, the organization could forecast usage hikes during peak seasons, like spring months. 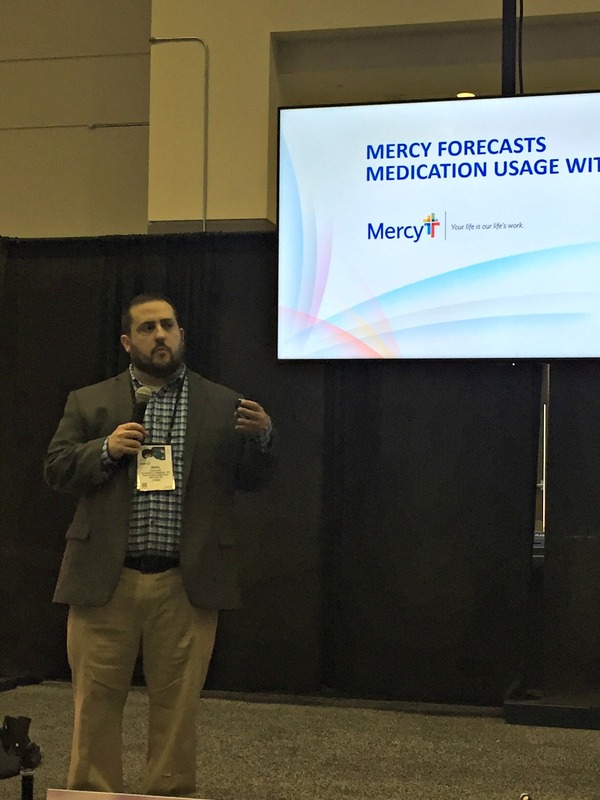 The predictive piece, in which all resulting forecasts are written into a table in SAP HANA, tells Mercy how to customize their stock in their Omnicell cabinets at each location for each time of year. This reduces the risk of shortages so that the organization can provide the best patient care and reduce excess inventory. I’m looking forward to HIMSS 2018, where I hope to hear results on this use case. I’m sure by then Mercy will have won more awards for their outstanding use of healthcare innovation to improve patient outcomes. If you missed Mercy’s session at #HIMSS17 today, and you want to discover more about how SAP Solutions improve value-based care, visit the SAP Booth #543 at #HIMSS17, February 19-23 and join Jamie Oswald at the booth on Tuesday, February 21 at 1pm (ET). For more on Mercy, you can read this blog and this business transformation study.